The 5 Most Famous Signs In The World — Addisigns, Inc.
Everybody has seen the famous “Welcome To Fabulous Las Vegas” sign that visitors see as they enter the city, but did you know that there are many other famous signs? Here’s a few you might know. This sign undoubtedly looks best at night when it’s lit up. In fact, it’s a bit unimpressive during the daylight, but many tourists stop to take their picture by it anyway. However, the technicolor neon site is unmistakable as an icon of the country’s biggest gambling city. Many imitation signs exist in an around the city. You can even buy a miniature version to decorate your home or business! This sign has been featured in many films and shows that take place in California. In fact, characters often try to evade the cops as they illegally climb on the sign. If you’re a Hollywood buff, you might also know that this sign originally read “Hollywoodland” and was built to advertise a new housing development. However, most people think of the shortened version today. Chicago is one place you might go to see a great show on stage, and the sign in front of the Chicago Theatre is where you should head. This brightly-lit sign has been in place since 1921, when the theater was built. It stands nearly six stories tall, so you can see it from Chicago’s State Street with ease. Many tourists associate the sign with the Windy City itself. The Route 66 sign is so well known to Americans that brands have used it to remain memorable. The actual signs decorate history Route 66, which you might know better as the Will Rogers Highway. This highway connects Chicago to Santa Monica, taking drivers through half of the country. Since 1927, the route has been marked by the history black-and-white signs. People will talk about your company for years to come if you put up an iconic sign like the ones on this list. 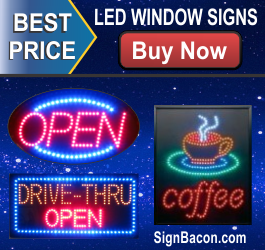 Your sign might be big or small, with or without lights. Whether you place it in front of your business or along the highway to bring in customers, your sign has to grab attention and speak to those who might be walking past or driving by its location. Let Addisigns help you pick out the next world-famous sign.